A two dimensional graphical representation of a continuous frequency distribution is called a histogram. In histogram, the bars are placed continuously side by side with no gap between adjacent bars. That is, in histogram rectangles are erected on the class intervals of the distribution. The areas of rectangle are proportional to the frequencies. Represent the data in the continuous (exclusive) form if it is in the discontinuous (inclusive) form. Mark the class intervals along the X-axis on a uniform scale. Mark the frequencies along the Y-axis on a uniform scale. Construct rectangles with class intervals as bases and corresponding frequencies as heights. The class intervals are all equal with length of 10 marks. Let us denote these class intervals along the X-axis. Denote the number of students along the Y-axis, with appropriate scale. The histogram is given below. In the above diagram, the bars are drawn continuously. The rectangles are of lengths (heights) proportional to the respective frequencies. Since the class intervals are equal, the areas of the bars are proportional to the respective frequencies. The heights of trees in a forest are given as follows. 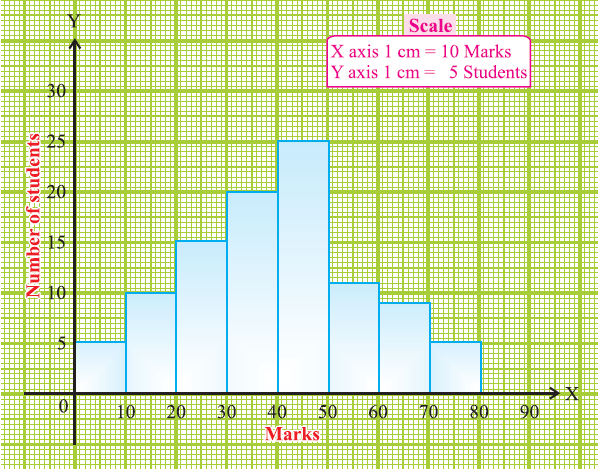 Draw a histogram to represent the data. In this problem, the given class intervals are discontinuous (inclusive) form. 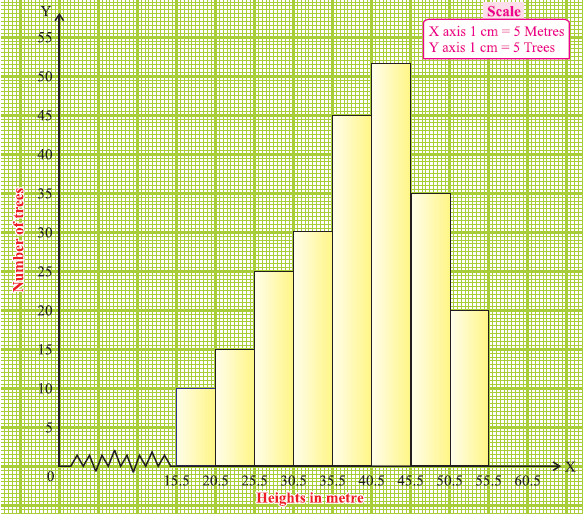 If we draw a histogram as it is, we will get gaps between the class intervals. But in a histogram the bars should be continuously placed without any gap. Therefore we should make the class intervals continuous. For this we need an adjustment factor. In the above class interval, we subtract 0.5 from each lower limit and add 0.5 in each upper limit. Therefore we rewrite the given table into the following table. Now the above table becomes continuous frequency distribution. After having gone through the stuff given above, we hope that the students would have understood "Constructing histogram". Apart from the stuff given above, if you want to know more about "Constructing histogram", please click here.